Fiber Flux: 2018 Fiber Flux Temperature Shawl CAL! 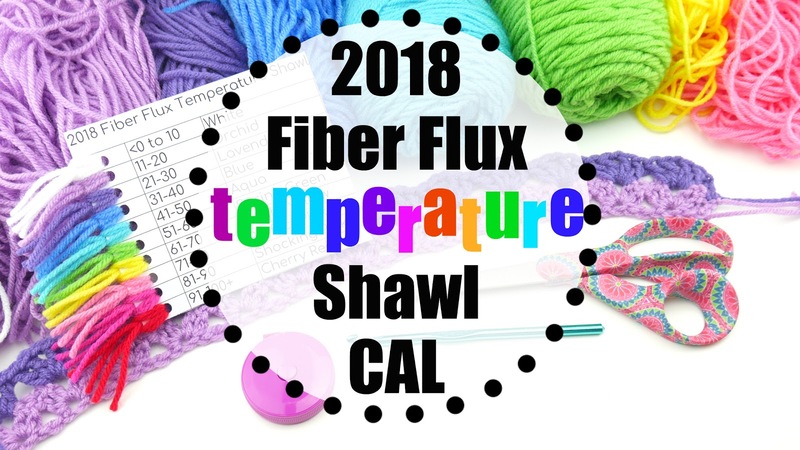 2018 Fiber Flux Temperature Shawl CAL! Happy 2018 lovelies! Today is all about temperature projects! I have ALWAYS wanted to do a temperature project of some kind, so here we go! 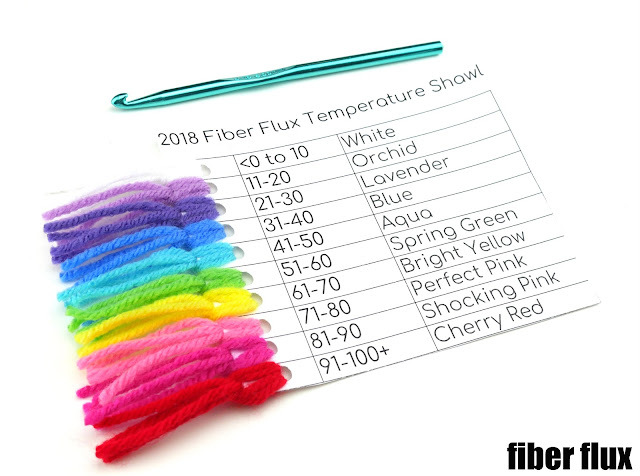 If you're not familiar with the concept, a temperature project is where you create a row on a project you're making based on the temperature outside...fun! It goes on for a year and at the end of the year, you'll have an interesting representation of the temperatures for an entire year! *We will be making one row per week (see details below), so I wanted to make sure we were at least two weeks into the new year before we started to enable us to have something to work with! We're going to create a shawl...a bit smaller than a blanket. However, I will give multiples for the stitch pattern so you can turn it into a blanket if you like OR smaller for a scarf! Even if you get a few weeks behind, it's only one row per week so no biggie catching up, right? I will provide seasonal updates on the progress of the shawl throughout the year. Important to note: my chart is in degrees Fahrenheit. However, you can adjust yours to Celsius if you prefer. I did a wide range of temperatures because it gets very cold and very hot where I live. Please adjust accordingly to your area of the world, if you live in a warmer region, your chart will have different ranges for example. To get your average weekly temperature, check out your local weather forecast or an app. Add up the temperature for each day and divide by 7 (number of days in the week). This is the number you'll use for the week. Check the color on the chart to see what color you'll need to complete your row! Below is the video...check it out for a full introduction to the project, supplies, plus the entire tutorial. There you have it...a fun, super low stress year-long project! Please visit and join the Fiber Flux CAL group on Ravelry to get updates, see everyone's progress (fun because we all live in different places in the world with a variety of temperatures! Also, get questions answered, help others, and show off your work. Worsted weight yarn of your choice...see swatch chart I made in the photos on this post (I'm using Red Heart Super Saver in cherry red, shocking pink, perfect pink, bright yellow, spring green, delft blue, turqua, lavender, orchid, white) This yarn has no dye lots, so great if you need to pick another skein of one of the colors later in the year...you don't need all of the yarn now! Swatch Chart (I typed mine and printed it on a piece of card stock, punched holes next to each color, then added a bit of the corresponding yarn...easy peasy! 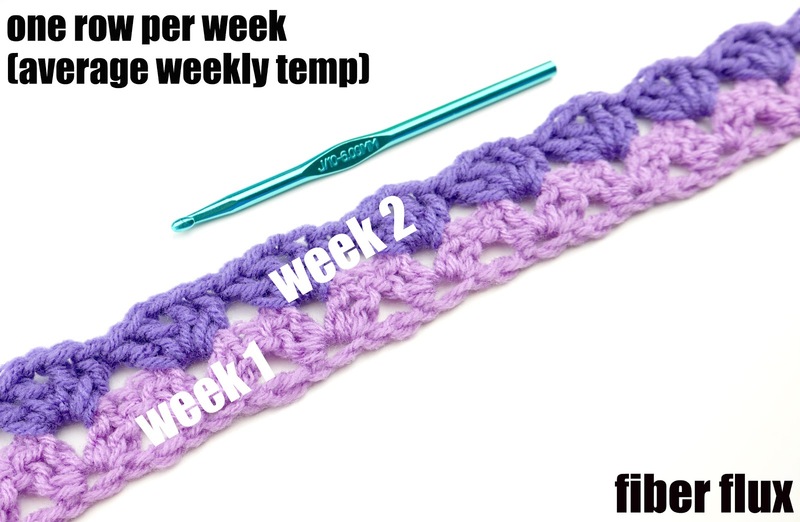 Check out the written pattern below and be sure to watch the video for an introduction to the project and step by step tutorial! Row 1: In the 5th ch from the hook work (2 dc, ch 1, 2 dc). *Skip 3 chains and in the chain after that, work (2 dc, ch 1, 2 dc), repeat from * across until 2 chains remain. Skip a ch, then in the last ch, work 1 dc. Row 2: Ch 3 and turn. Work (2 dc, ch 1, 2 dc) in each ch 1 space from the previous row (center of each fan). Work a dc into the turning chain space. Repeat row 2 for the remainder of the shawl, working one row each week of 2018! Use the hashtag #2018fiberfluxtempshawl to share your work or tag @fiberflux on social media! This isn't the year for it, but I like the weekly average idea. I also love your color choices. I may be back to try this another time. Nothing says you can't start in the middle of a year and go year to year that way either. I'm joining this challenge for the Temperature Shawl. I love the idea! Thank you for explaining it so well! It's such a fun idea! I love doing CALS! I once saw a blanket size sheet on your blog, but I don't know how to find it again! Could you please give me a link to it? Thank you very much! I am going to do a blanket and choose 1 specific time of day and do mine daily. I have always been intimidated by making something big enough for my bed and I think this will keep my anxiety down. Thank you for this idea. I LOVE IT!!!!! !